I’ve always been a short track rider. 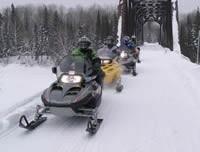 For years I was convinced that the 120 inch snowmobile models were better suited for the type of riding I do here in Ontario, Canada. Over the years I customized my short track with 1.75 inch track, larger, wider skis and finely tuned clutching to be able to navigate off the trail. A quick look at some of my YouTube videos will demonstrate that this little sled went some wild places that most riders would say a short track could never venture. Sometimes it wasn’t easy and many times I found myself turning back and following the same track out, after reaching an obstacle I couldn’t navigate over. When I encountered sections of endless powder it was a real strain to push my short track for extended distances - it just had to work too hard. 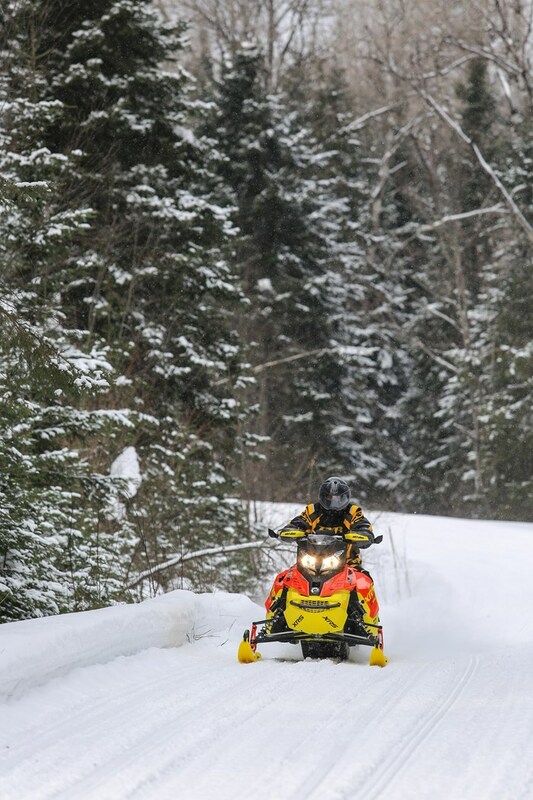 On the trails and in the ditches, the Ski-Doo Renegade X-RS calibrated short track was a blast to ride, it excelled in the whoops and was easy to navigate in the tight stuff—after all this is what it was designed for. On the other end of the spectrum I’ve had the opportunity to ride the Summit and enjoyed the boondocking capabilities but found that when I encountered a windy table top groomed trail I couldn’t wait to get off of it and back into the deep. Riding a short track and then the Summit model left me wondering what the experience would be like on something designed for all of the terrain noted above. 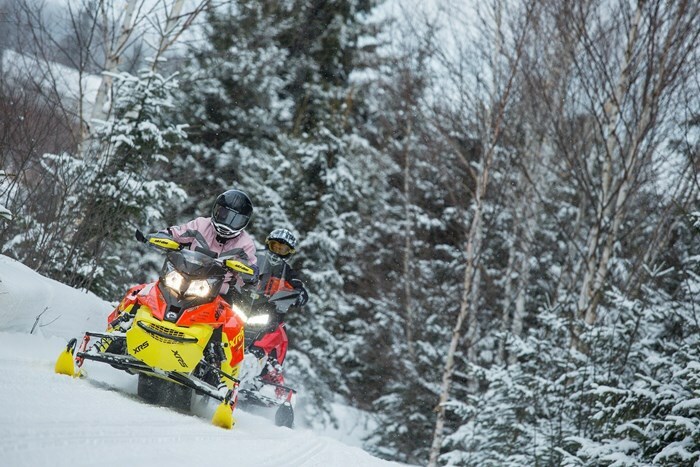 There is no better place to test varying conditions of on and off trail, and of course, the space to be a little bit of a renegade, than the Abitibi Canyon Loop Tour north of Cochrane, Ontario, Canada; and that is just what I had the opportunity to do aboard the XRS Renegade. The Renegade model comes with all of the right goodies for a great trail experience no matter what the conditions are. The KYB Pro 40 adjustable shocks with the rear rMotion suspension setup are capable of everything from railing corners to hucking this race bred XRS off a gnarly hilltop whoop. 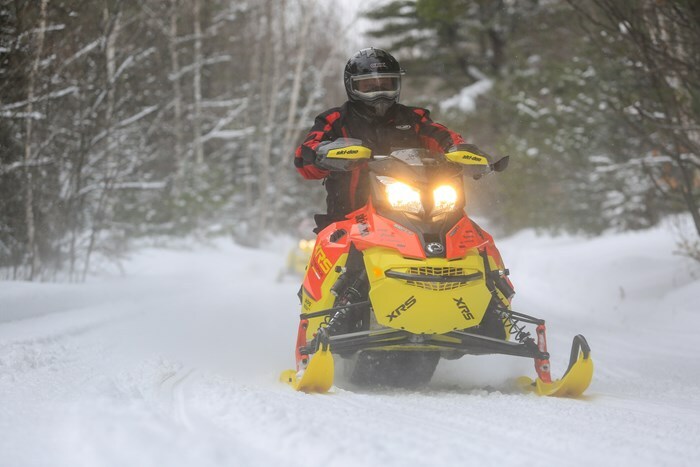 Best off all, everything on both the front and rear suspension is easily adjusted in a few seconds with Ski-Doo’s Quick-Adjust running board mounted system. Off trail the Renegade XRS is quite capable, it’s no Summit or Freeride, but the 137-inch skid with the 1.5 ripsaw does a decent job of pushing snow. 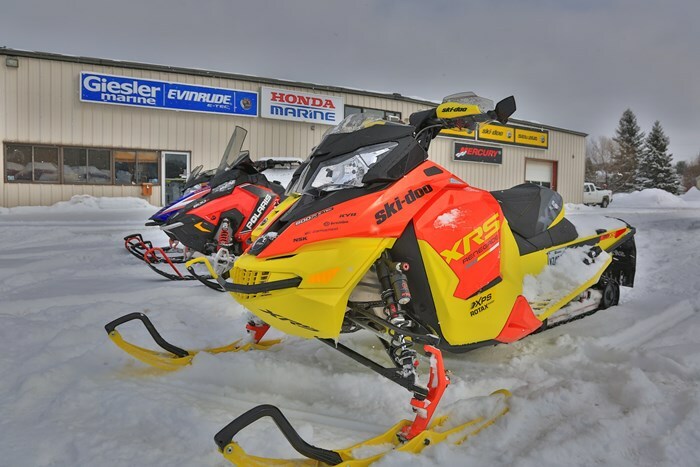 If you’re planning on riding logging roads and utility corridors this sled preforms well in the deep snow and is superior to the shorter model XRS. 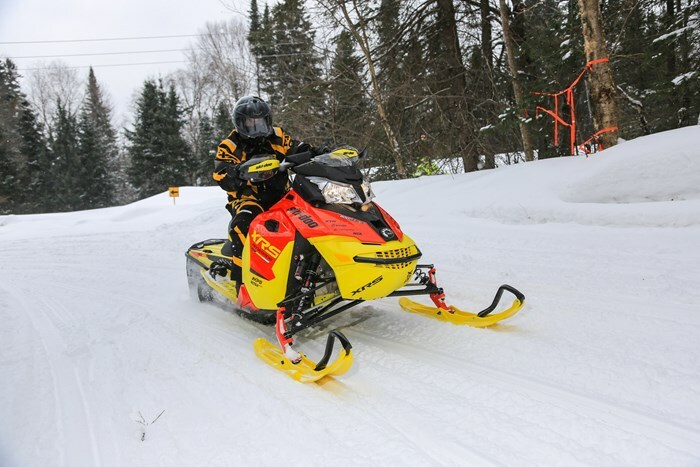 What is impressive is this snowmobile’s ability to tackle rough terrain such as ungroomed, whooped up single-track trail through the woods as well as the occasional hill. 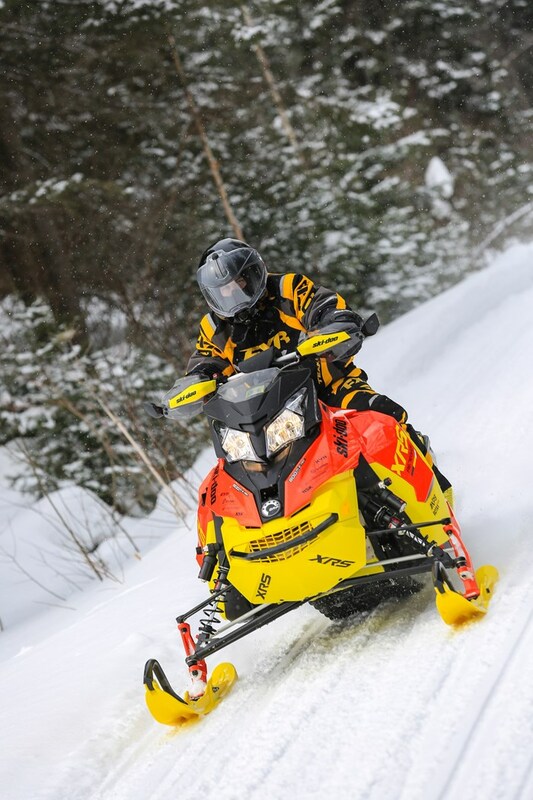 The one thing you’re going to notice as soon as you jump on this sled is the running quality of the 800 ETEC engine. It’s smooth and quiet compared to a conventional two-stroke 800 and even the previous years of the 800 ETEC model. Ski-Doo has done a bang up job of refining this 160+hp power plant. I’m sure they have made some slight tweaks to the programming and calibration of the electronic rave valves over the years, improving on what was already incredible. 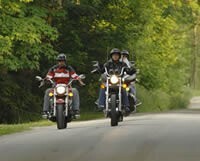 If you’re anything like me, you’ll mash the throttle to the bar, listen and feel the ponies at work and never look back. If this isn’t your idea of a good time perhaps you should look at something a little less high strung – you can’t own a race horse and keep it in the pasture all the time! Don’t believe me that the 800ETEC has legs? Check out this video! When the XRS Renegade was first released, die hard Doo fans gawked at the colour scheme and even compared it to one of the world’s largest fast food chains mascots. But I’ll tell you when you put this brightly coloured sled on the snow it looks sharp! Other features that complement the versatility of the XRS renegade is the firmer and taller seat which is a good match for the style of the XRS rider. 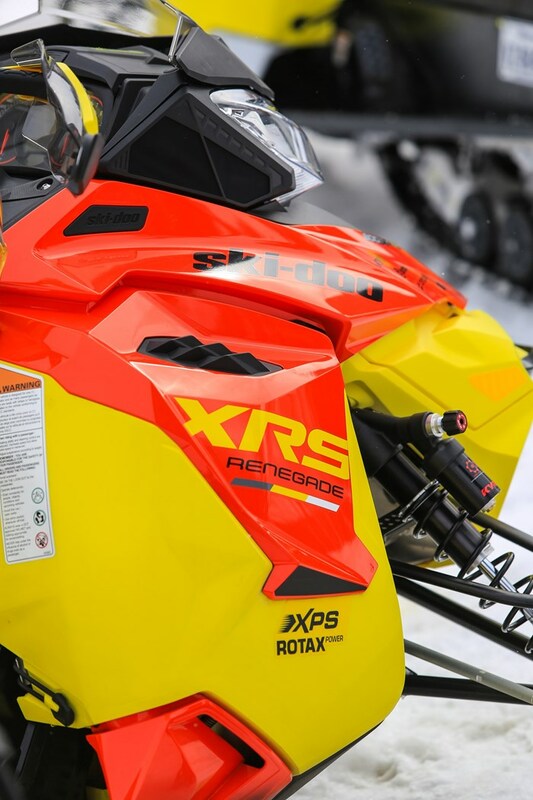 As with previous year XRS models, the sled has the premium gauge package which is a nice feature, but I’ll guarantee you that you won’t be looking at the gauges while you’re in motion! If you’re the type of rider who likes to do a bit of everything, the XRS Renegade may be the perfect fit for you. It’s a great upgrade for short track riders and riders of the very popular X package Renegades. 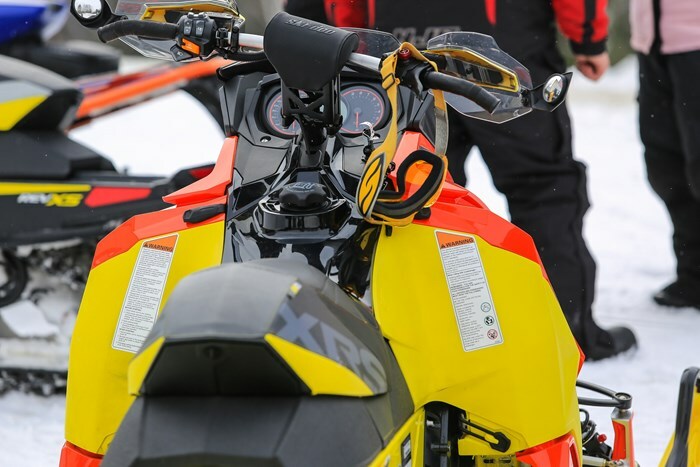 It should also be a strong consideration for the rider looking to have one of the most technologically advanced, visually brightest and most versatile snowmobiles ever built! See you on (or maybe off) the trail!